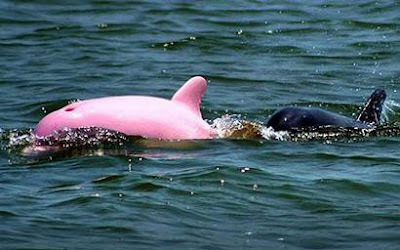 In Lake Calcasieu, Louisiana, a pink dolphin has been discovered! The dolphin's "stunningly pink" color is the result of albinism, which is indicated by its red eyes as well as its pink skin. Don't worry, the dolphin is totally healthy. He's just pink! Charter boat captain Erik Rue spotted and photographed the pink dolphin, saying, "I had never seen anything like it. It's the same color throughout the whole body and it looks like it just came out of a paint booth." Regina Asmutis-Silvia, senior biologist with the Whale and Dolphin Conservation Society reminds folks to "be careful, as with any dolphins, to respect it - observe from a distance, limit their time watching, don't chase or harass it." That way everyone can enjoy the fabulous dolphin for as long as he lives!